All our feather banners, sail banners and quills are available to design and order online 24/7. 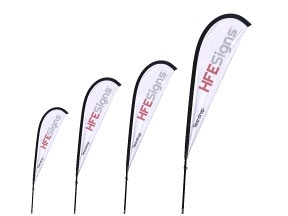 Feather Flags – Get spotted and enforce your brand with professional feather flags from HFE Signs. Feather flags are the perfect way to make a branding statement. 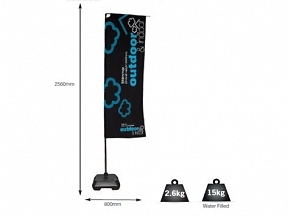 Feather flags can be used on hard ground or soft ground by selecting the required base. Feather flags are often seen at sporting events or national stadiums, feather flags are the preferred choice for the larger corporate sponsors and professional branding experts, simply because the make a statement above and beyond any other form of physical advertising at this level of cost. Feather flags are a portable display and generally used for short periods at a time, they are therefore quick to assemble and come with everything that is needed including a carry bag! We have a range of flag styles available as shown above and it really is down to the preferred choice, all flags work incredibly well and are sure to get attention. Where can I use my feather flags? Feather flags are a short-term temporary product and therefore, generally the don’t require planning permission, however if you are unsure it might be worth checking with your local council to be on the safe side. Feather flags are ideal for shows, outdoor events, trade shows and festivals. Feather flags can be used indoors where you have plenty of height, for example exhibition centres or sports arenas. What should I have printed on my flag? Generally with printed flags you only display a word or two or a logo, the purpose of a feather flag is simply to let people know you’re here, if you’re looking to add more information then you should consider a roller banner. Will my flag be double sided? Most feather flags are printed on one side with the image bleeding through to the other side in mirror image, 99% of all feather flags are printed in this way and the hang and look best like this, remember the flag is doing its job and people generally expect the opposite side of a flag to be in mirror print. Flags can have a block material sewn into the middle and then another stitched to the other side, this gives a 3 layer flag where each side is printed without any mirror, it must be noted that this is not always the best solution and it won’t hang and flap quite the same as a single sided with bleed type flag. Can I wash my feather flag? All feather flags can be machine washed on a cold setting, to protect from shrinkage and to protect the flags dye we suggest cold only, no detergent and certainly not a tumble dry! Can I change my Flag design? 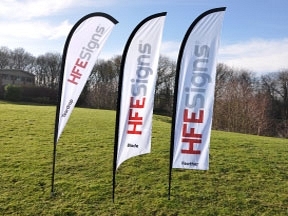 At HFE we keep a record of your order so if you want a change in design at a later date we can supply you just the print, you don’t need to buy a full feather flag system. We have some customers who order one flag system and a multiple of flag prints for different events. We also have spare poles in case one gets damaged. Can you colour match feather flags? We understand the importance of branding and consistency in colours, however due to the technology it is not possible to guarantee a 100% colour match, however we have produced feather flags for some of the very larger companies and plc’s and we very rarely have colour issues. If your flag colour is important it is best to provide us with a Pantone reference and we will do our very best to get as close as possible. How do I design my feather flag? 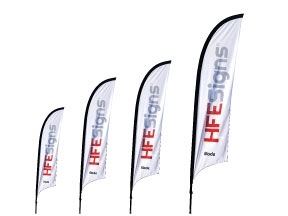 HFE offer a free of charge design service, simply let us know what you want printed on your feather flags and we will design it and send you a proof. Alternatively, you can design all flags online, simply add you preferred feather flag to your basket and look for the design now option in checkout (before any payment is taken). If you already have your own flag artwork you can email it or upload it online (again in checkout). We try to make it as easy as possible for you to order your bespoke feather flags! How long does it take to print feather flags? The general turnaround time for all feather flags is 4 working days, however we do suggest allowing a little more time just to allow time for any courier problems. If you are looking to order a large number of feather flags we would as you to contact us for an accurate lead time as larger orders will take longer than 4 days, but the good news is you are likely to get a quantity discount! Can you send feather flags to Northern Ireland & Highlands? 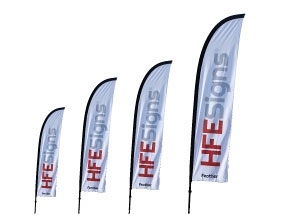 At HFE we cover the whole of the UK, we offer a very fast turnaround on all our products including Feather Flags, many products come with a discounted delivery charge based upon quantity and this is the same with feather flags. Generally, the lead time to Northern Ireland and the Highlands is an extra day or two and the couriers do charge more money, we try to help as much as possible with flags and all other products, its best to contact us and let us know your full quantity of Flags and any other products and we’ll certainly do our best to help.